With so many art events happening, it can be a challenge to decide which exhibitions and events to visit, so I've handpicked a few for you - across India. I hope to add more cities and towns soon. Do visit those in your vicinity and let me know your views. Which ones resonated with you? Drop me a line here. I look forward to hearing from you. 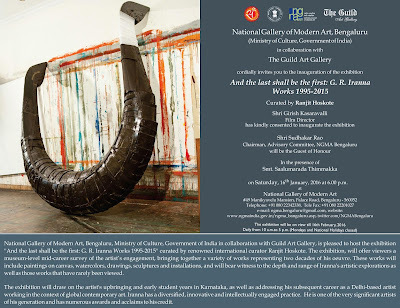 NGMA Bengaluru, in collaboration with The Guild Art Gallery presents the exhibition "And the last shall be the first: G.R. 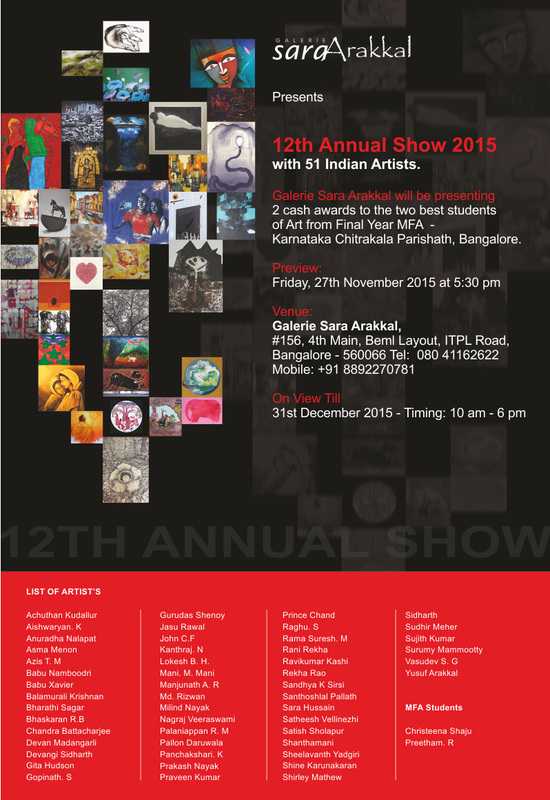 Iranna Works 1995-2015", curated by Ranjit Hoskote, on view from 16th Jan - 16th Feb, 2016. Medicine Corner’s centrepiece is an exhibition titled ‘Tabiyat: Medicine and Healing in India’, which examines the history and contemporary practice of sustaining human health in one of the world’s great civilisations. 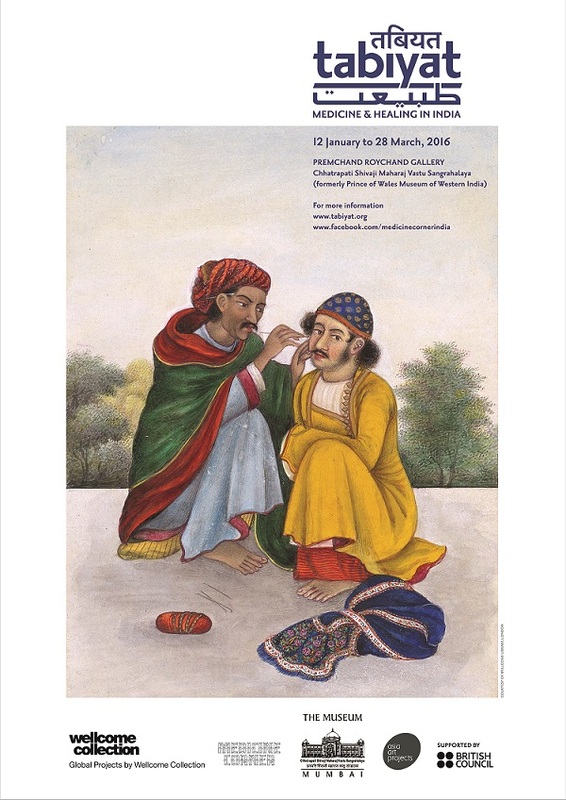 From January 12 to March 28, 2016, CSMVS, hosts dazzling antiquities and contemporary material culture assembled by Wellcome Collection, one of London’s most exciting new cultural spaces. Exhibits include the only known historical illustration of the interior of the human body as understood in Ayurveda. None of the antiquities have been exhibited before in their land of origin. The exhibition also features modern vernacular art in an aesthetically seductive, intellectually rich mix of art, science, history and the ordinary made extraordinary. In ‘The Piercing needle’, Gopika Nath presents herself as an artist-craftsperson. A predominant image in much of her work is the teacup. Peering into her cup emptied of garam masala chai revealed over time an appreciation for the quotidian beauty of residue. Her meditation on these marks and stains from tea serve as a catalyst for introspective enquires as well as initiating new methods of staining and burning to translate the effects onto fabric. While discomforting experiences are recalled and examined, threads are unravelled and surfaces scorched, burning through and beyond the heart of the matter at hand. Using embroidery as an artistic marker, with the needle as a natural substitute for a pencil or a brush, Gopika forges a link with the age-old traditions of hand-crafting in India, to see the work of the hand as part of human creative expression and by extension - a process of discovery of who we are. She uses the language of embroidery with stitch as a spiritual metaphor, where working with needle and thread becomes therapeutic and cathartic – a healer and balancer. 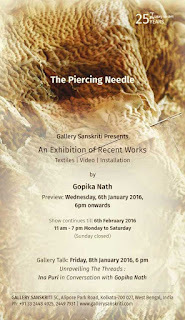 Even though Gopika is an artist that embroiders, rather than paints, she adeptly imbues her work with the same aesthetics as found in fine art painting – the same finesse, sensibility, and aesthetic of understanding between hand and canvas, between mind and image, and between perspective and result.